Most houses in our street were terraced, only a few had an alley on one side that attached the street to the alley that was behind them. Ours was one of them. Officially you owned that part of the alley that bordered your house and garden but you could not refuse anybody to use it to pass. We sometimes had discussions whether people had the right to sit next to your garden in the alley and observe your movements in the house. Some people would enjoy the sunshine at the end of the day over there because they had completely filled their garden with all kinds of goods. Mostly junk, but one neighbour had his garden stacked with all kinds of wooden buildings that housed pigeons. This man was a middle aged man who obviously was divorced. Once in a while there were teenagers visiting. We assumed they were his children. When it was the season for competition between the pigeons he would spend complete weekends on a stool accompanied by his mate. 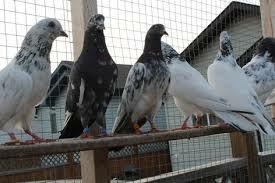 There would be a crate of beer next to them and they would look anxiously at the sky for any signs of his pigeons. Less nice was that they constantly were looking into our house too. It made us feel uncomfortable, especially when they would say something to the other and had a good laugh. Sometimes we could see pigeons getting in. Another reason for the two friends to open a new bottle. On Sunday evening he would go to meetings where the results were made known to the contestants. So sometimes he would celebrate with new beers and at other times would drink a few to be able to accept his loss. After that he would he have to go home on his moped. And every time the same thing would happen: he would try to ride through the alley and he would not make it. So we could hear a big bang and a lot of cursing and he would walk the rest of his way home. It was a miracle he never got hurt. The situation got worse when we got a kitten. When our pet grew up he showed that he was a bit wild. The cat was not very fond of staying indoors and would scratch furniture and wallpaper to convince us to let him out. Like all cats he was a nature lover, in particular a bird lover. So the neighbour soon yelled a few times to me to keep the cat indoors. He would sit in front of the pigeon houses and make the birds nervous. So he threatened to splash buckets of water over him. That was okay with me, I told him. So a few times the cat came home really soaked. On a regular basis the cat brought birds to the house. He would be acting very proud, we praised him and tried to save the life of these poor animals. Most of the times they were just a bit shocked and after some rest we could put them back into nature and they would fly away. The cat would be locked in the bathroom for some time where he would moan like hell. Once the cat came home with a lovely little pigeon. And – bad luck – this one got really hurt. It died in my hands and I felt very guilty towards our pigeon man. My wife saw it as a sort of compensation for the harassment she felt because of him looking at us all the time in our house. I was in doubt: should I go over to him and tell about the death of his pigeon and give him some money to compensate the loss? Nonetheless I sneaked into the garden at a moment I knew he was not there and buried the pigeon. Within an hour he was in front of our door. I was about to start about the pigeon when he showed me an official writing from the city hall. He asked me to read it for him. He admitted he was not able to read or write. I helped him with this letter and also with his tax papers that he showed me after that. He told me he had been discussing with his mate if we could be trusted with his problems. After a lot of hesitation he had come over to ask us. Later that week he proudly showed me the buildings for his pigeons. He didn’t have any small pigeons, he only owned competition pigeons and didn’t miss any. And he told me that our cat never came in his garden after the treatment with buckets of water.